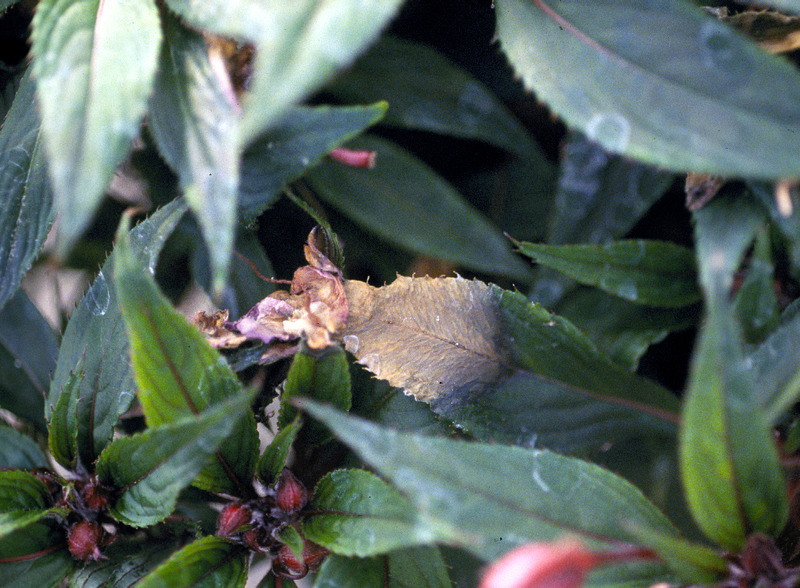 Botrytis colonized flowers may fall onto leaves allowing the fungus to gain entry into these tissues. Sporulation of the fungus on old leaf tissue. 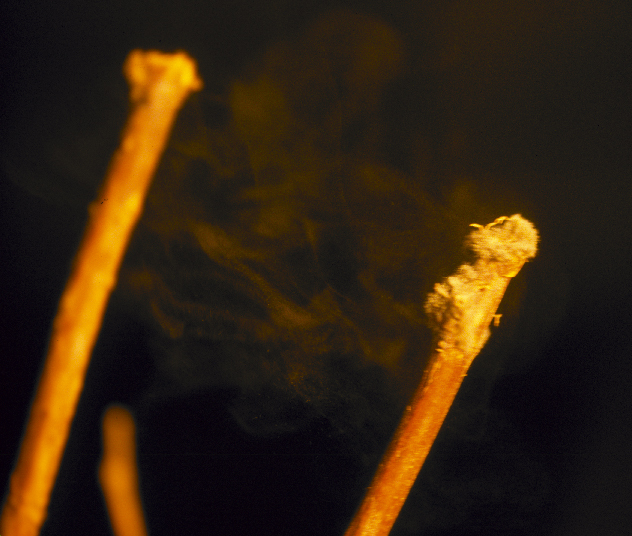 Spores of Botrytis look like smoke in the air after this colonized stem was bumped. Cause Botrytis cinerea (sexual: Botryotinia fuckeliana) and other Botrytis spp., fungi that colonize dead, dying, and wounded plant parts. From these infections they can attack healthy tissues. A moist, humid environment is ideal for pathogen sporulation and spread. Spore dispersal is stimulated by changes in relative humidity. Conidia may come from many sources in and outside the greenhouse. Concentrations peak in the greenhouse during irrigating, spraying pesticides, harvest, and shipping. It is found everywhere plants are grown and has a wide host range wide host range including African violet, Ageratum, Ajuga, Aphelandra, aster, begonia, Caladium, Calceolaria, carnation, chrysanthemum, coleus, cyclamen, fuchsia, geranium, gloxinia, hosta, Iberis, impatiens, lily, Lobelia, marigold, orchid, pansy, Pericallis hybrids, petunia, poinsettia, primrose, rose, snapdragon, verbena, viburnum, zinnia, and zygopetalum. Geranium is considered highly susceptible to a point that it could be a significant harbor of the pathogen for other greenhouse crops. Flower petals are most susceptible at any stage of development. Blossom blight, leaf spots, and bud and stem rots are common. Leaf blights can start when infected floral tissue falls on healthy leaves. Plant parts, such as roots, corms, rhizomes and stems, in cold storage can also be injured. Symptoms Blighting of leaves, petioles, blossoms and stems is the most common symptom. Initial infections, particularly of petals, appear as water-soaked brown to tan spots. 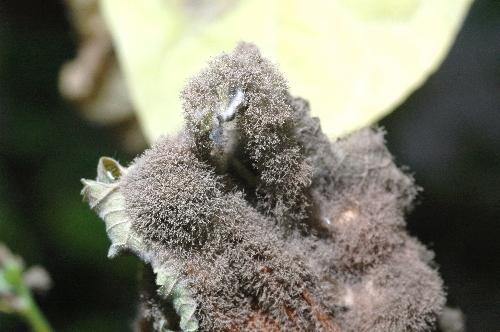 In humid conditions, a fuzzy fungal growth, brown to gray, appears around the infected plant part. Infections move quickly to healthy tissues under ideal conditions. Blossom infections may cause petals to fade and die prematurely. Crown rots, stem cankers, cutting rots and damping-off are other problems that can occur due to this fungus. Cultural control An integrated strategy combining environmental management, cultural practices, and fungicides will most effectively manage this disease. Thoroughly clean and sanitize the greenhouse before production. Remove all dead and dying plant parts (particularly blossoms) on and around plants and take them out of the greenhouse. Many growers use closed containers to minimize the amount of conidia. Maintain a steady, relatively dry environment by keeping greenhouse humidity below 90%, increasing spacing between plants for good air circulation, and taking care not to splash water on foliage during watering. Heating the greenhouse at night or venting around sunset may be necessary. Heating in the morning before sunup can also help prevent dew formation as air temperature increases faster than the temperature of plant parts. Spacing plants also allows better light penetration, reducing senescence of the lower leaves and thus helping reduce the amount of highly susceptible plant tissue. Eliminate weeds from inside the greenhouse and around doorways and vents outside of the greenhouse. Avoid leaving large stubs on stock plants after cutting. Place fans in greenhouse to get better air circulation. Forcing dry air for 2 days on cut geranium stock plants, beginning within hours of cutting, significantly reduced gray mold. Covering greenhouses with long-wave, infared-absorbing plastic film may help by reducing greenhouse cooling at night. Other coverings that increase the blue: UV ratio can inhibit sporulation of some Botrytis isolates but is highly variable between crops and isolates of the fungus. Chemical control Fungicides do not compensate for poor sanitation or environmental controls. Resistance to many different and multiple fungicide groups has been documented worldwide. To prevent developing resistant fungi, alternate or tank-mix materials from different groups with different modes of action. Also, limit applications from any specific group to two (2) or fewer sprays. Be sure to check labels for crop safety before application. A bioassay using the sunflower 'Sunspot' will detect fungicide resistance. Affirm WDG at 0.25 to 0.5 lb/100 gal water. Has "some" level of control. Group 19 fungicide. 4-hr reentry. Chlorothalonil-based products (Group M5 fungicide) such as Daconil Weather Stik, Echo, Equus, and Exotherm Termil. These products may be used on a wide variety of plants but may discolor some blooms. Floral damage from these products may actually favor gray mold. Can be effective if used well before symptoms might develop. Useful as a broad spectrum mixing partner for fungicides at high risk for resistance development. Several home formulations are also available. 12- to 24-hr reentry. Decree 50 WDG at 0.75 to 1.5 lb/100 gal water. Labeled for several ornamentals. Very effective product and rated as top choice by growers. Resistance is common in small fruit crops. Group 17 fungicide. 12-hr reentry. Emblem at 2 to 4 fl oz/100 gal water. Use with oils or adjuvants may cause plant damage. Group 12 fungicide. 12-hr reentry. Group 3 fungicides are labeled for Botrytis control and may have some activity with high variation so are not generally recommended alone. Group 7 fungicides, the carboxamides, are available alone and in pre-packaged mixes. The newer materials in this group have been very effective on Botrytis. Resistance is a problem, which is why they are not to be used alone. Group 11 fungicides are labeled for Botrytis control and may have some activity with high variation are not generally recommended alone. Iprodione (Chipco 26019). May be used on many specific plants. See label for details. Resistance is common in several crop systems. Also rated high by growers. Group 2 fungicide. 12-hr reentry. Mancozeb (Fore, Protect DF) also is labeled for Botrytis control on many specific plants but may not be very effective alone. Useful as a broad spectrum mixing partner for fungicides at high risk for resistance development. Group M3 fungicide. 24-hr reentry. Medallion WDG at 2 to 4 oz/100 gal water is registered for use on several ornamental plants. Do not use on impatiens. Use with oils or adjuvants may damage plant. Moderate control. Group 12 fungicide. 12-hr reentry. Mozart TR (total release) at 1 can/4,500 sq ft of greenhouse. Total release fungicides may not provide adequate coverage of the underside of leaves. Group 12 fungicide. 12-hr reentry with no ventilation. Spirato GHN at 2 to 4 fl oz/100 gal water. Use with oils or adjuvants may cause plant damage. Group 12 fungicide. 12-hr reentry. Terraguard SC at 4 to 8 fl oz/100 gal water is labeled for Botrytis control and may have some activity. Do not exceed 2 oz/100 gal water on impatiens plugs. Group 3 fungicide. 12-hr reentry. Thiophanate-methyl-based products such as Cleary's 3336, OHP 6672, and Systec, plus a surfactant may be used on many flowers and ornamentals, but certain plants are not listed on the label. Test on a few plants if you are unsure of potential phytotoxicity. Fungal resistance is common so tank mix with other fungicides. An effective product if resistance is not a problem. Group 1 fungicides. 12-hr reentry. Pre-packaged mixes of two or more of the above products, such as Mural (Group 7 + 11), Orkestra (Group 7 + 11), Pageant (Group 7 + 11), Palladium (Group 9 + 12), Spectro (Group M5 + 1), or Zyban (Group M3 + 1), are available. Biological control Use in conjunction with other control tactics such as thorough sanitation. Note: Some registered products offer only suppression of this disease and thus are not recommended for use. These products include Mycostop. References Hausbeck, M.K. and Moorman, G.W. 1996. Managing Botrytis in greenhouse-grown flower crops. Plant Disease 80:1212-1219. Veloukas, T., Markoglou, A.N., and Karaoglanidis, G.S. 2013. Differential effect of SdhB gene mutations on the sensitivity to SDHI fungicides in Botrytis cinerea. Plant Dis. 97:118-122.